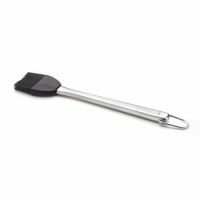 Basting brushes are typically used for basting your meat or applying thin sauces to your food while cooking. A typical basting brush used to have natural hair bristles and a wooden handle. 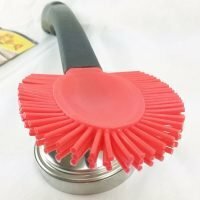 Newer basting brushes have silicone bristles and some even have entire silicone handle for easy clean up. Basting brushes work better with thinner runnier sauces then a sauce mop. A good test to see if you need to use a basting brush or a sauce mop will is to stick a piece of silverware (we use a knife) into the sauce and pull it out. If after a few seconds most of the sauce has run off use a basting brush. If the silverware stays well coated use a sauce mop. Most basting brushes used when grilling have a longer handle than the kind you use in the kitchen. This helps you keep your hands away fro the heat a little more. 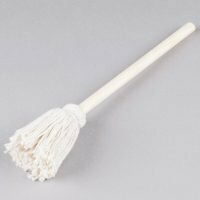 The better basting brushes can be thrown into your dishwasher or have bristles that can be removed for cleaning. My personal favorite is the bendable kind, I bend the head at a 45 degree angle and it can sit in the sauce pot without it falling over.